By Maurice Schoonbroodt. Heather Kreamer, Music Director for Create Advertising, spoke to our group recently, listened to songs and gave feedback. This was the 5th in NARIP’s 10-part series with trailer music supervisors. 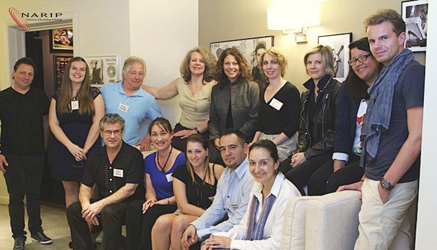 Front Page Photo (L-R, back row): APM Music’s Steven Stern, NARIP’s Mary Bee, independent song plugger Peter Kimmel, NARIP’s Tess Taylor, Create Advertising’s Heather Kreamer, NARIP’s Isil Caliskan, North Star Media’s Molly Bohas, NARIP’s Lindsay Berganza and Maurice Schoonbroodt. Seated: Eden Norris, Heavy Hitters Music’s Cindy Badell-Slaughter, NARIP’s Simone Grau, composer Gerard Vargas, APM Music’s Giselle Vasconez. For a trailer music supervisor, the creative process of selecting music starts with watching a part of the film. The client comes in next for a creative meeting. The producers and client consider the various ways in which the film could be marketed and usually refer to previous campaigns. The next step is writing the script [for the trailer]. And finally, the music! At this point, Kreamer says she starts to “pull” or select music for the trailer, typically thought of as a mini-movie with three “acts.” Only once was Kreamer able to nail the music for a trailer with her first submissions. More often, the client or studio provides feedback to the music she submits and requests more (or different) music. Frequent changes in musical direction for trailers are common, especially given all the decision-makers involved. For example, Kreamer noted that she is up to her 210th folder of music for Spiderman due to changes in direction. The project has been in the works for some time since starting off with a teaser. As of now they are working on the second trailer and she is still needs more music. Frequent changes occur because test results from market research that the film studio runs tests in an attempt to make the movie attractive to the broadest possible audience. With all the music she listens to constantly, we asked how she files it away and/or remembers it for use at a later date. Kreamer said she has a great memory for music and can remember when a song moved her and can also usually connect it to a specific date or time frame. Kreamer sees trailers as mini films with three acts. The first act serves as a teaser to let the audience know what the movie is about. The second act has more movement, with a different music cue(s). The third act is a “big insane ending, getting bigger and bigger” she says and is always the toughest. She uses library music to set up acts, but she always needs a BIG third act. Kreamer prefers custom composed over library music, and says this is her favorite part of her job. Occasionally there is even a fourth act at which point the music has to get even bigger. It is the continuation of the third act, it gets cut away and comes back with a “sting” or graphic in an even bigger way. Trailer editors play an important role in which music is selected. They love starts and stops in the music which enables them to fit in dialogue. They also like little parts, breakdowns and changes, says Kreamer. Clients get bored easily whenever there are not enough changes or different directions. Also, she doesn’t place songs which were used before in trailers, editors remember these and so it’s a struggle to find a great song which hasn’t been used too much. Sound design has become a huge part of creating trailers however too much sound design can get confusing, says Kreamer. The solution is often streamlining and cleaning up the trailer music. Metadata should be complete with song title, artist, all writers, contact info for all rights holders. Certain files (such as .wavs) don’t hold metadata which make the files unusable for her. AIFs or MP3 files are preferred, she listens her music in iTunes. Kreamer’s tips include “do your homework!”. She also recommended that anyone interested in trailers should watch EVERYTHING on apple.com and soundtrack.net, know the market and what types of music trailer music supervisors use. Most important, “make sure your music is properly tagged so I can find you. I want to go on iTunes click ‘Get info’ and see who wrote it, see the keywords, phone number and email address.” Tagging material is crucial. If someone sends me a CD without tags on, I’ll throw it in the trash.” She and her staff simply don’t have time to track people down. Lastly, Kreamer said, “please be patient with music supervisors as we’re extremely overworked” and unfortunately do not have time to respond to every phone call and email. The challenge – as with most supervisors – is how little time there is. “I really like that track, it has a great vibe. It’s really good for the opening of a film and it could really work for a trailer, if you find the right one. Will keep it in mind for the right one,” she said of the track Workin’ Man’s Blues performed by Aceyalone featuring Cee-Lo, submitted by North Star Media’s Molly Bohas. “Good for another Underworld,” she said of In The Dark submitted by Bohas. “Definitely usable” according to Kreamer. “We love slow builds. Your first two acts are trailer cue all the way! Love these weird sounds. It has modern and orchestral sounds which people love at the moment,” she said about The Super Hero’s Saga submitted by Gerard Vargas. “I’m doing a 30-second TV spot, … and I like where that first build starts before we go that other section, which is disturbing but in a good way,” she said of Behind Closed Doors submitted by Heavy Hitters Music Group’s Cindy Badell-Slaughter. “I really like her voice a lot!” she said of Rain Perry’s songs The Compartmentalized Thing and Idaho. The fifth in NARIP’s Trailer Music Supervisor Sessions series, this intimate session enabled registrants to prepare pitches in advance, meet Heather face-to-face, have her listen to their music and receive immediate feedback. In some instances, attendees were able to tailor tracks to better suit Kreamer’s immediate needs and be more “on brief” and therefore much more likely to be placed. Heather Kreamer is Director of Music for Create Advertising, an entertainment marketing company. She oversees all music needs for their Los Angeles and London offices. This includes finding and licensing the perfect commercial music, as well as working with composers to create custom scores. Prior to joining Create, Heather spent 5 years running the music department of mOcean, another entertainment marketing agency. Her background includes building the film and television department for INgrooves, a global music distributor. She began her music career at Natural Energy Lab, where she signed artists and marketed their music for sync placements. Heather has worked on hundreds of successful motion pictures marketing campaigns, including The Amazing Spiderman, The Avengers, Captain America and The Vow, to name a few.